What do you picture in your head when I mention “The First Christmas”? If I were to venture a guess, even if you are not a believer in Christianity, you would have a mental picture of the nativity scene. You know the plastic shepherds, the three wisemen all in stoic poses a baby that is unnaturally molded into the hay and for some reason a drummer boy – which is what every new mother would want around right after giving birth and trying to get an infant to sleep. And doesn’t the fact that Mary is the only woman around strike you as odd? I don’t know a lot of guys that like to flock to birthing rooms. Of course there are somewhat more realistic renditions of the scene. The most recent, of course, was in the film titled simply “The Nativity”. In which the characters traveling from Nazareth to Bethlehem had to ford a river and fight off a snake likely symbolizing Satan. Of course anyone familiar with Israel’s geography would know that there are no rivers to cross on the way to Bethlehem. There is the matter of the wisemen that I was kind of expecting to break into a three stooges routine at any moment. And to top it all off was the ray of light from a star that shined upon the manger scene. I just about lost it in the middle of the theater when I saw that. Was this really what the first Christmas was like? The answer of course is no. The word Christmas means literally Christ’s mass and it is referring to a church service that was established in 1038. The church leaders were trying to establish a calendar of religious events, the most important of course being Easter. As they established when Easter would be celebrated they also decided to have an obligation service to commemorate Christ’s birth as well. Much like how we celebrate president’s day in the US. It isn’t actually anyone’s birthday – it is just a symbolic gesture of honoring your leaders. As the Christian religion spread around the world they encountered many cultures that had celebrations of light and life in the midst of the dark winter months. The Christ’s mass was combined with many of these celebrations as a way of working within the culture rather than simply trumping one system over another. After all, there are not a lot of evergreen trees around Bethlehem. Yet it was still centralized around going to church. Saint Nicolas day which was celebrated on December 6 was combined into the winter celebrations and has evolved into the modern day Santa. Today there is a push to look back at the first Christmas, but in reality that would have been a pretty dry boring thing to be a part of. Is that really what we want to push for? 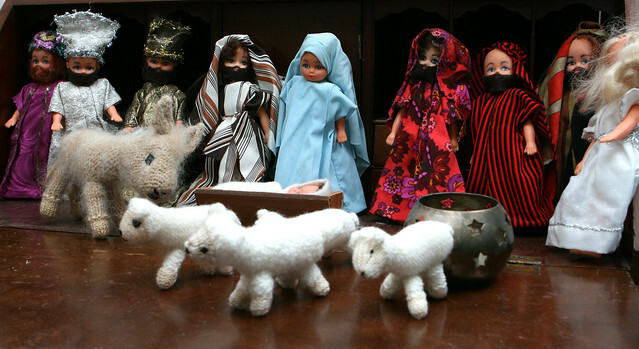 If I really want to focus on the birth of Christ, go bring some good news to the local outcasts (Shepherds). Go wade through the dark and dirty places of life (The stable) and realize that Jesus (the light of the world) went into such place on purpose. Turn the kingdom of this world upside down (so much you are hunted down), look for dreams, visions and angelic visits, and be open to God changing the rules (the virgin with child). Where would we be more like to find Jesus in the rich sanctuaries or the dark alleys? Think about it. Maybe we should let Christmas go in favor of Christ himself. What do you think?